Please contact our office at 217-359-2500 if you would like to schedule an appointment or have any inquiries. If you call while we are closed OR we are unable to answer your call when you call, please leave a detailed voicemail and we will return your call as soon as possible. If you have a dental emergency, during off hours, you may call the office at 217-359-2500 to leave a message and find the emergency phone number on the voicemail. If applicable, the E.R. may be the best option for immediate dental attention. 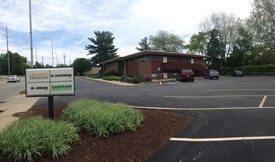 Please note: We are located in brown 60's style building just west of Busey Bank on Kirby Avenue, near Prospect Avenue. Unfortunately our building is neither handicapped nor wheelchair accessible. We are more than happy to help you or your loved ones up and down the stairs. Please just ask!